I have commenced upon a project to build an index and set of accompanying services rooted in English/American literature spanning the 15th to 20th centuries. For the lack of a something better, I call it Project English. This blog posting describes Project English in greater detail. At the present time, the whole thing consumes 184 GB of disk space where approximately 1/3 of it is XML files, 1/3 of it is HTML files transformed from the XML, and 1/3 is plain text files transformed from the XML. At the present time, there are no image nor PDF files in the collection. On average, each item in the collection is approximately 135 pages (or 46,000 words) long. 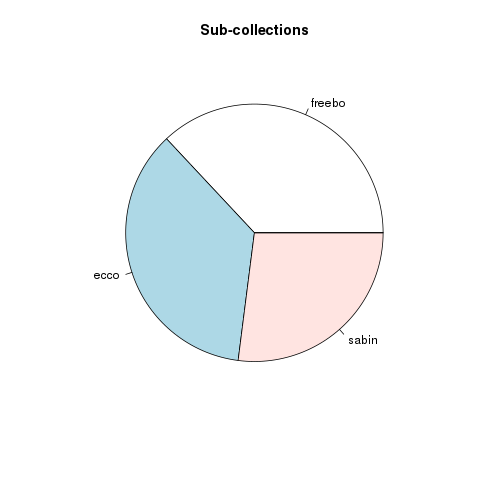 As of right now, each sub-collection is equally represented. 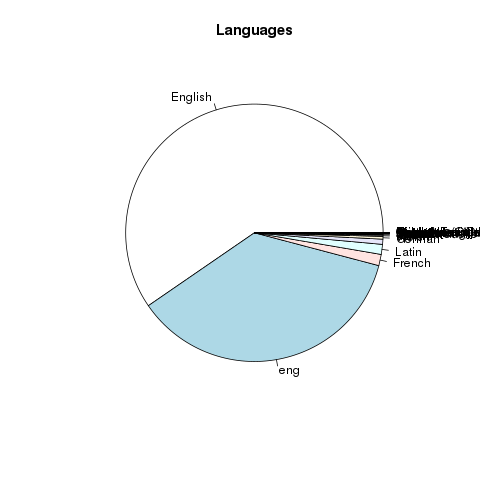 The vast majority of the collection is in English, but other languages are included. Most of the content was published in London. 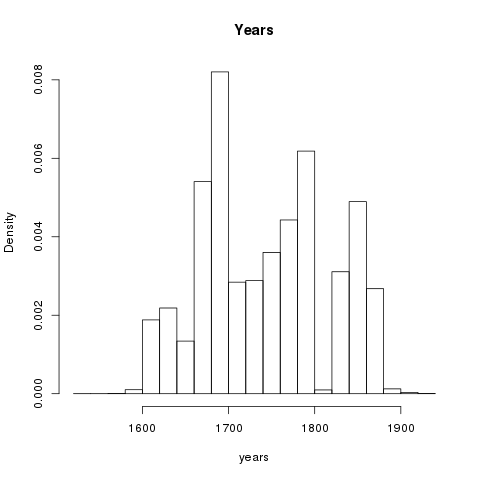 The distribution of centuries is beginning to appear balanced, but determining the century of publication is complicated by the fact the metadata’s date values are not expressed as integers. The following charts & graphs illustrate all of these facts. What is this particular item about? To what degree does this item mention the words God, man, truth, or beauty? What actions take place in a given corpus? If one were to divide the collection into T themes, then what might those themes be? How has a theme changed over time? 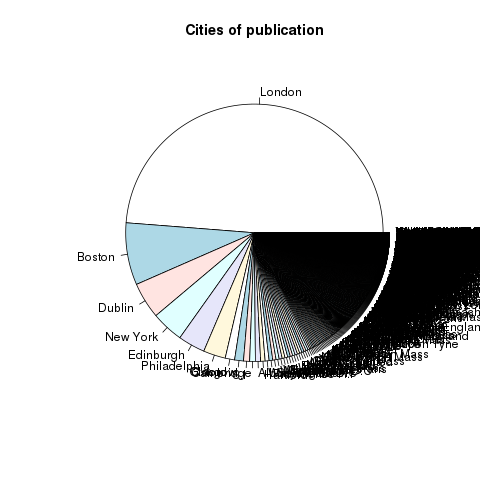 Who, what places, and what organizations appear in the corpus? What ideas appear concurrently in a corpus? In the case of Project English, the rare & infrequently held materials are full text items dating from 15th to 20th centuries. When it is all said & done, the collection may come close to 2.5 million titles in size, a modest library by most people’s standards. These collections are being curated with scope, with metadata, with preservation, and with quick & easy access. The value-added services are fledgling, but they will include a sets of text mining & natural langage processing interfaces enabling the learner, teacher, and scholar to do “distant” and “scalable” reading. In other words, instead of providing access to materials and calling the work of librarianship done, Project English will enable & empower the reader to use & understand the materials they have acquired. Librarianship needs to go beyond the automation of traditional tasks; it behooves librarianship to exploit computers to a greater degree and use them to augment & supplement the profession’s reason and experience. Project English is one librarian’s attempt to manifest this idea into a reality.